I didn't feel like making separate meals tonight. A meal that my kids would eat, which also has to be gluten free, and a meal for my husband and I. So instead I whipped up a batch of corn pancakes. It's a lovely change of pace from regular pancakes. I serve the kids' pancakes with either maple syrup or applesauce. My husband and I enjoy them topped with creme fraiche and chopped chives. This recipe could also be made not gluten free by just using all-purpose flour in place of the gluten free flour. Makes 10-12 pancakes. Place corn kernels in a food processor and puree until it looks like creamed corn but chunkier. Combine milk, eggs and butter in a large bowl and beat well. Sift together flour, sugar, baking powder and salt; fold into egg mixture. Add corn. Mix well. Heat skillet or griddle over medium high heat. Pour batter onto cooking surface in 1/4 cup increments. 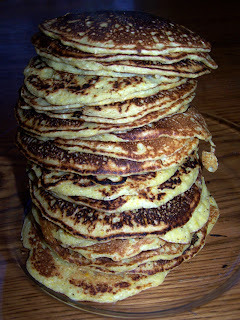 Cook until bottoms of pancakes are set and golden brown, flip over and cook the other side. Repeat until all your batter is used up.